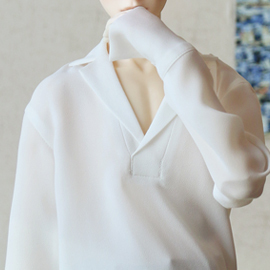 It is a daily chiffon material shirt. We used the chiffon material to express the flowing loose fit. There is no front closure, and the shirt collar is treated deeply that it does not look stuffy. The cuffs of the sleeves are made wide and long, emphasizing the feeling of the overfit. If you will add a romantic necklace or accessory on the neck, it'll be able to produce more beautifully.